Submitted by Brett Baker on February 19, 2013. Hilma af Klint: A Pioneer of Abstraction is on view at the Moderna Museet in Stockholm through May 26, 2013. 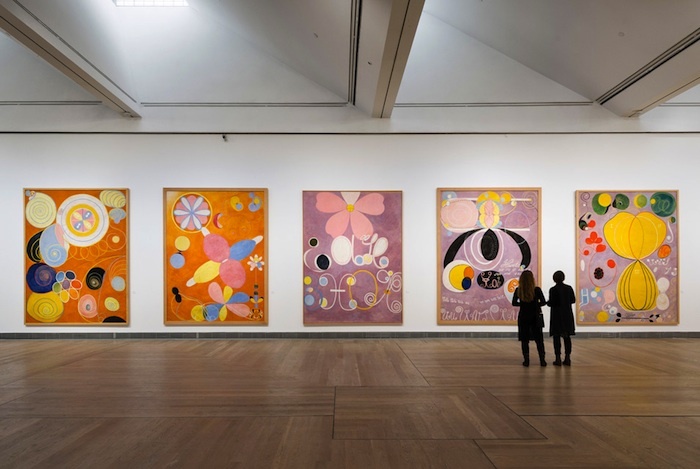 The subject of a rare retrospective exhibitinon at the Moderna Museet, Hilma Af Klint was a pioneering abstract painter and one of the most enigmatic artists of the 20th century. "[Hilma Af Klint] had no relationship to any other avant garde circles, being completely isolated in Stockholm at that time… her imagery is very, very similar - close to what later Malevich, Mondrian, and Kandinsky... were developing... [the] first abstract work that she was making was in 1907, two years before Kandinsky." "Hilma Af Klint's work was… esoteric, that means it wasn't shown during her lifetime. She herself in her last will said that this is 'for the future,' this is the message for humanity for the future." The following video, produced by the Moderna Museet, Stockholm, is in Swedish, but provides an excellent visual overview of the Hilma Af Klint exhibition.